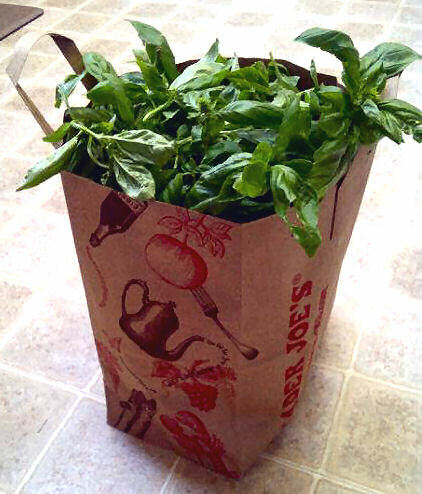 Every spring I plant a few small basil plants, and then plant just a few more because it never seems like enough. 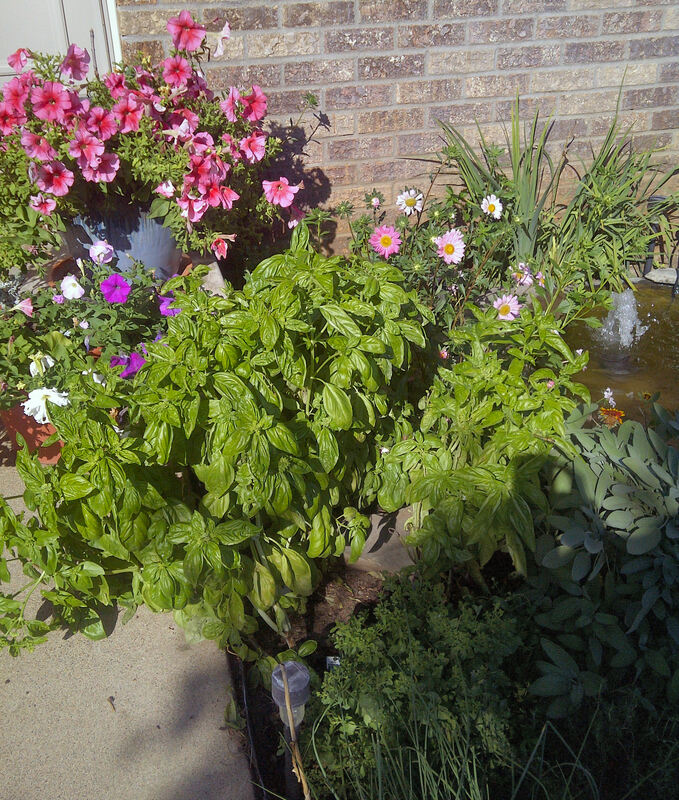 Then comes summer, and I manage to get busy with summer things while the basil grows like crazy and takes over the herb garden. 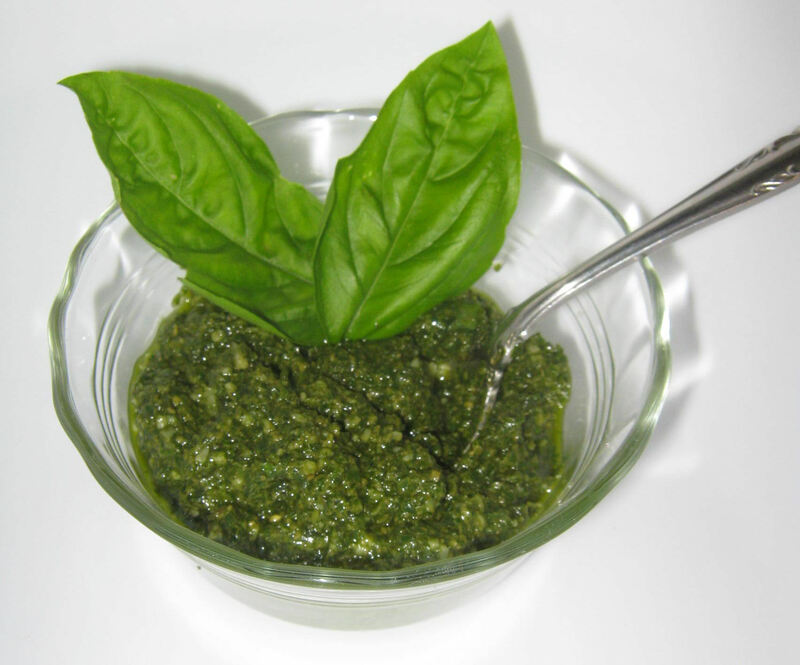 Then as soon as our visitors have to navigate the basil falling over the sidewalk just to get to the front door, I cut it all back and make a huge batch of pesto. 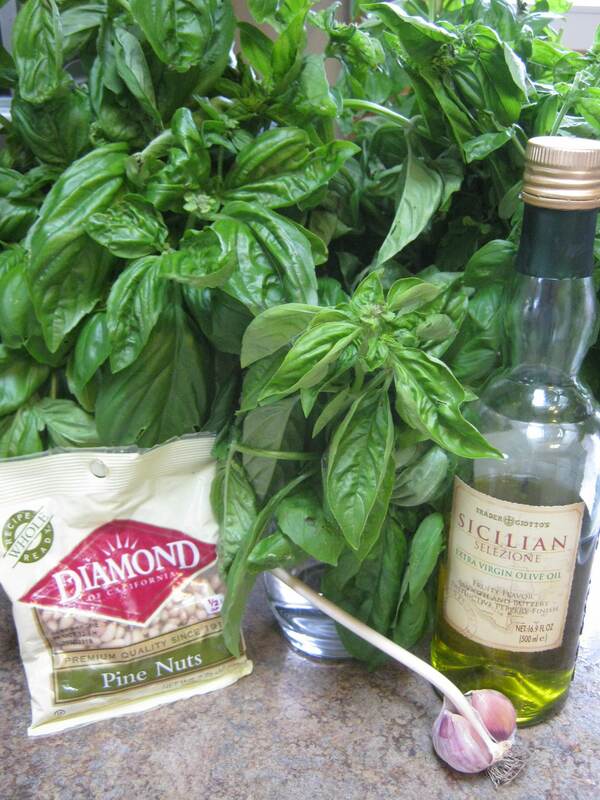 This is a great way to use up fresh basil, and it can easily be frozen for a splash of summer flavor any time of year. Step one: cut down the basil jungle while it’s still covering only half of the sidewalk. Let’s get started. Gather all your ingredients: there aren’t many. Be sure to use a good quality extra virgin olive oil, as this plays a large role in the final product. The biggest, most time consuming step of this entire process is to pull the basil leaves off the stems and wash them. 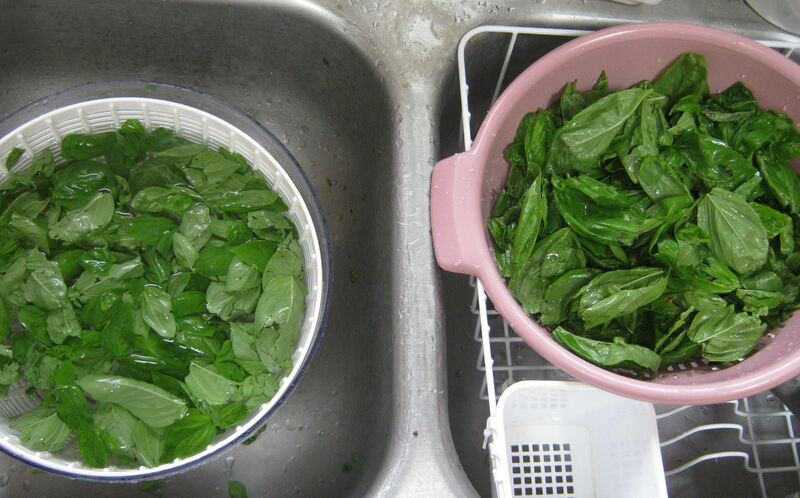 I like to use my salad spinner, filled with water, to rinse the leaves, and a separate colander to let them dry a bit. Then I give them a final spin, in small batches, in the salad spinner to dry them well prior to making the pesto. Take a break from pulling, rinsing, and spinning the leaves to toast the pine nuts. 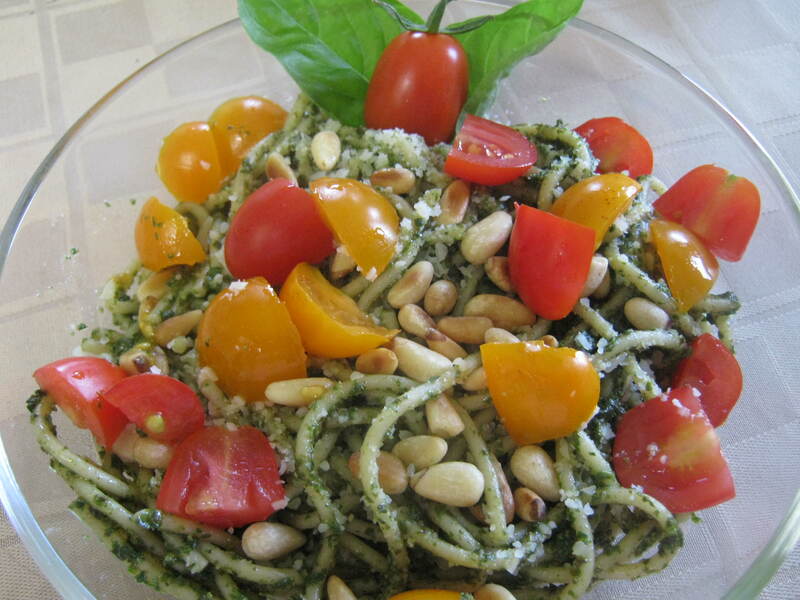 Toasting them really pulls out their nutty flavor, making for a tastier pesto. Just pour them in a single layer into a hot pan, and keep tossing and stirring them. Once they start to brown, they will brown quickly, so keep a close eye on them and do not burn them. 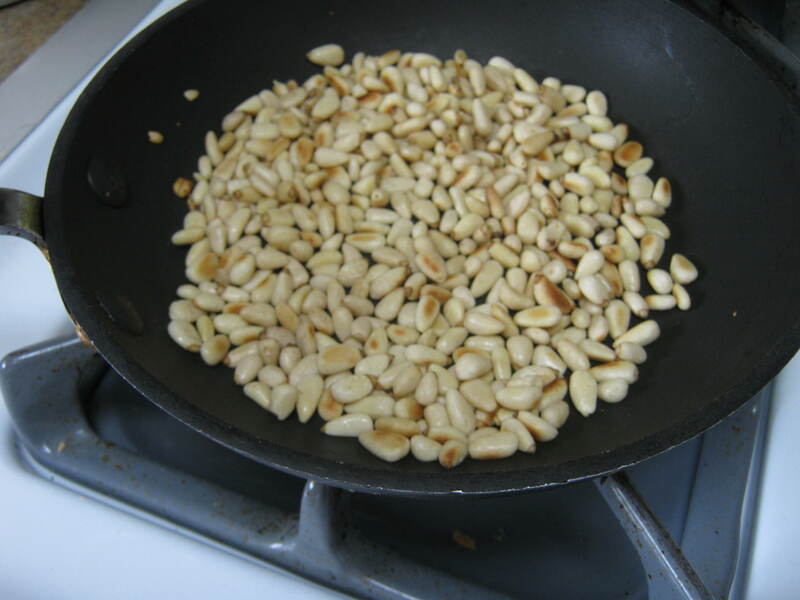 When both sides of the nuts are lightly browned, remove the pan from the heat and let cool. 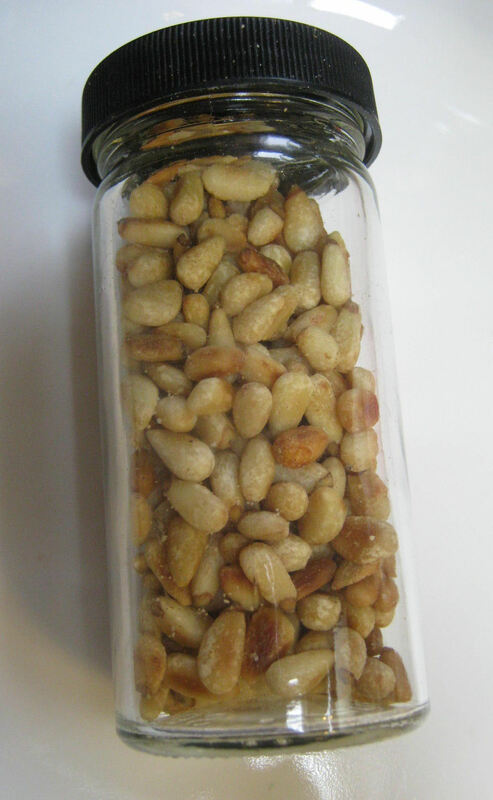 I like to toast more nuts than I need for the pesto, and keep the rest in a jar to add to salads and pastas. But I digress. Back to the basil. 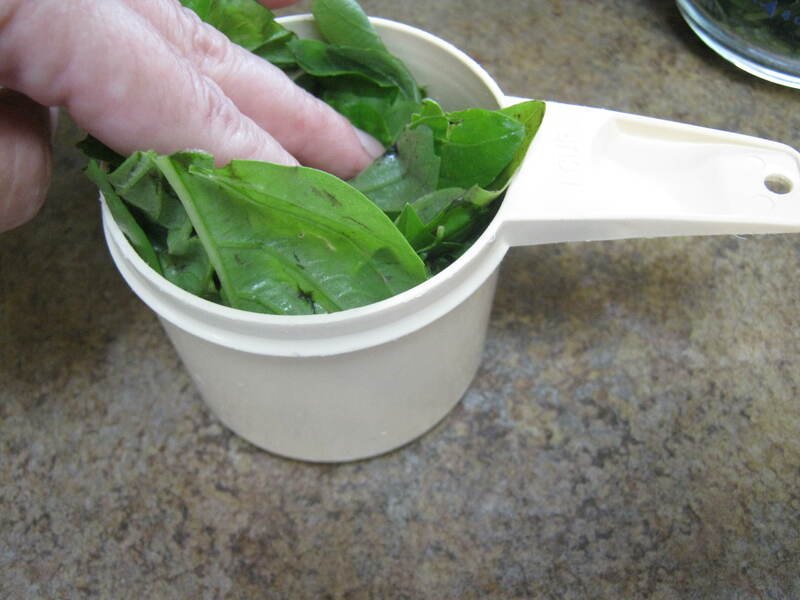 Once you have the leaves washed and dried, measure out 3 cups’ worth, packing them in pretty tight. 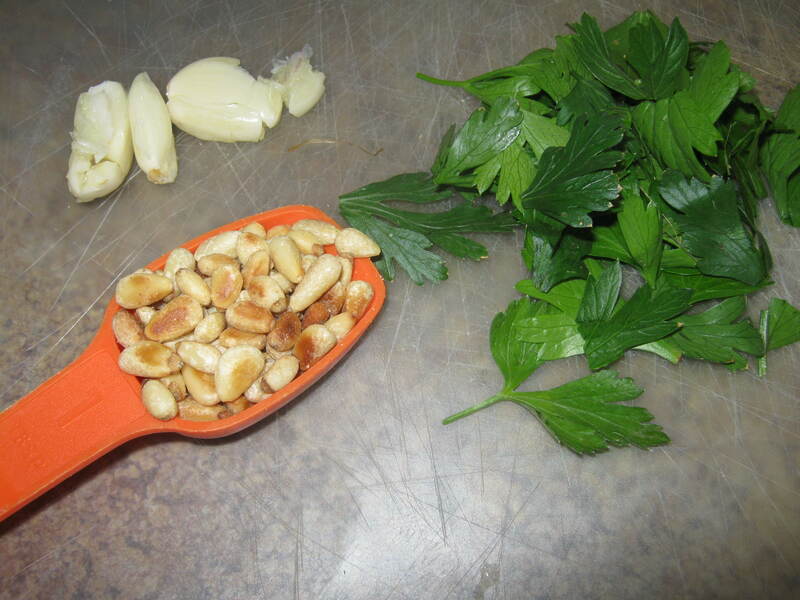 Smash and peel the garlic, chop the parsley, and measure out the pine nuts. Don’t worry about being too exact with these quantities. Not pictured is the salt: start with ½ t, as it can get pretty salty, especially after the cheese is added in the final step. Only then can you add more salt, if needed, to get the flavor you want. 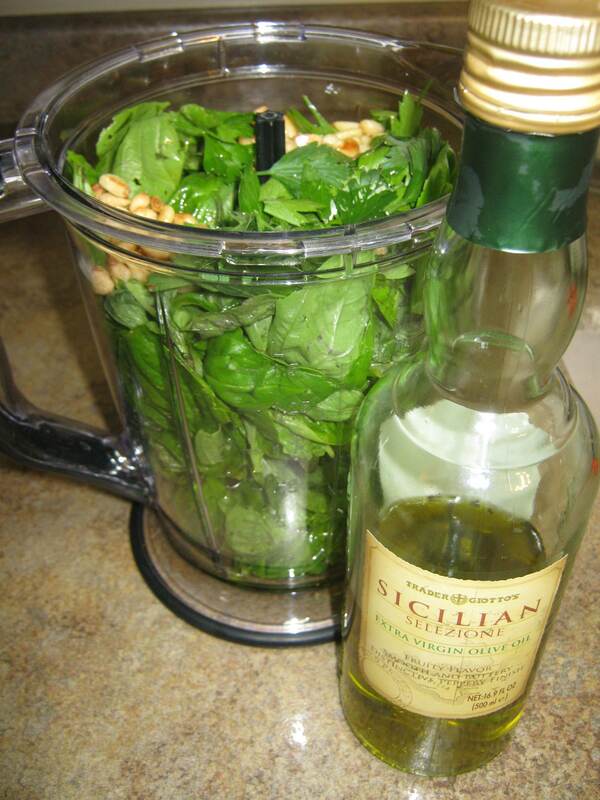 Place it all in the blender, and then pour in the olive oil. 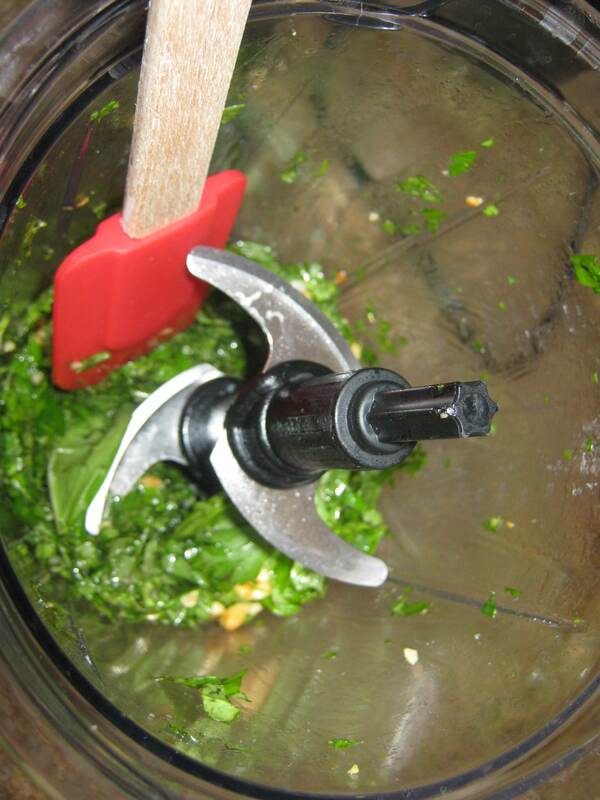 I find a blender works a little better than a food processor, but if you scrape the sides often enough, either one will work. Just don’t scrape while the machine is running. I have ruined more than one batch of pesto with the unintentional addition of shredded spatula. Keep scraping and blending until it becomes a smooth paste, then transfer it all to a bowl. The final step is to add the grated cheese. Use a hard Italian cheese, like Parmigiano-Reggiano or Parmesan, and grate it finely (if you didn’t buy it already grated). Grate it by hand with a microplane grater or cheese grater (using the smallest holes), or, since the blender is dirty anyway, just wipe it out and add small chunks of hard Italian cheese. Pulse to grate. 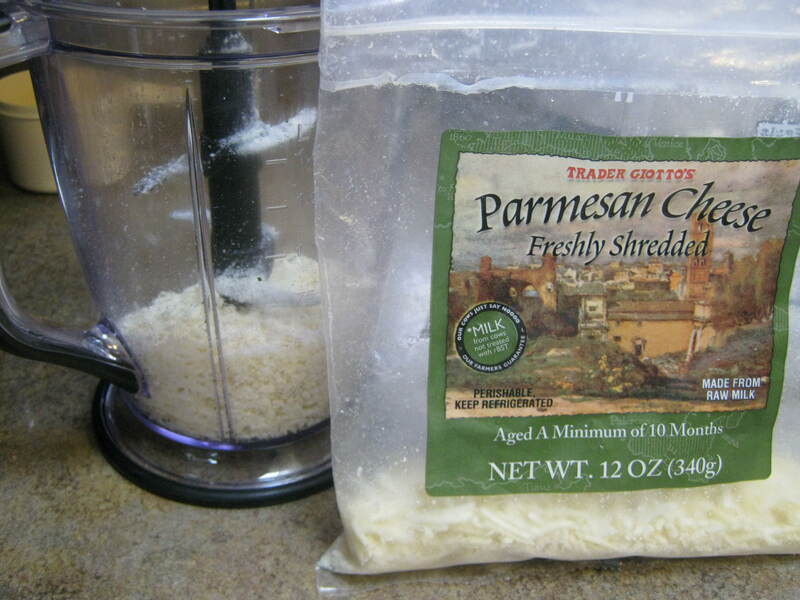 Here, I used shredded Parmesan and grated it to a fine texture. 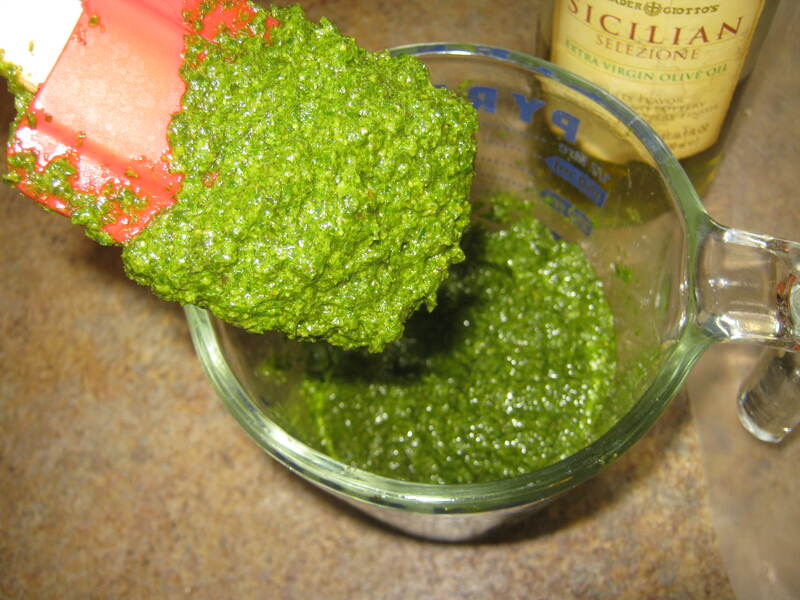 Stir the grated cheese into the pesto mixture (*unless freezing the pesto). To get a better frozen texture, leave the cheese out and just freeze the blended mixture. I spoon it into ice cube trays, freeze, then remove the pesto cubes and keep them tightly sealed in a freezer bag. They last pretty much forever. Just add the cheese after thawing, and a little more olive oil if it seems dry. Add more olive oil and/or salt, if desired. Use as a spread in sandwiches, as a dip for crusty breads, or — my favorite — toss with pasta and fresh tomatoes. Enjoy! Your secret is safe with me, but do give this a try someday. Once you figure out that pastry business, spread the basil on a sheet of pastry, cut it into strips, twist them up and bake til crisp. Pesto sticks! 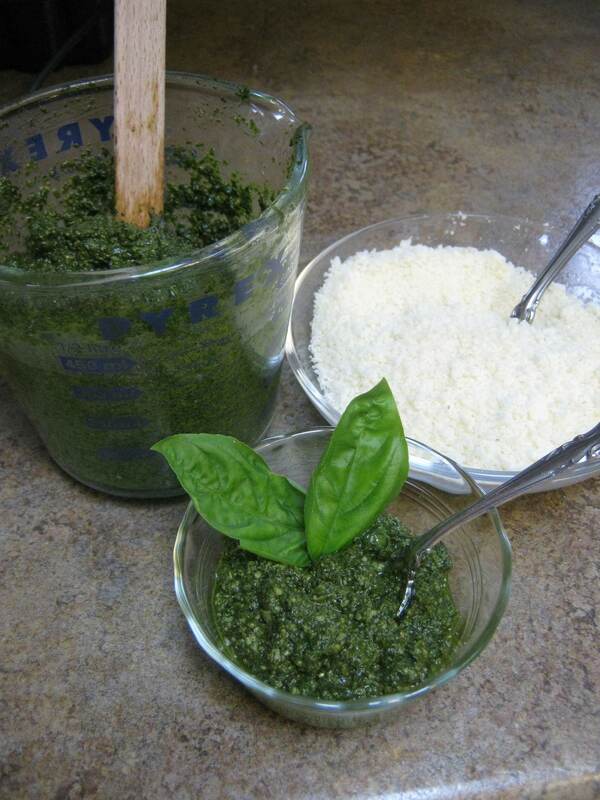 I have a TON of fresh basil and wanted to make a pesto before we have a freeze here in Oklahoma (still a ways off!) and I lose my plants! I’m going to try this recipe today. Great photos and “how to” instructions!